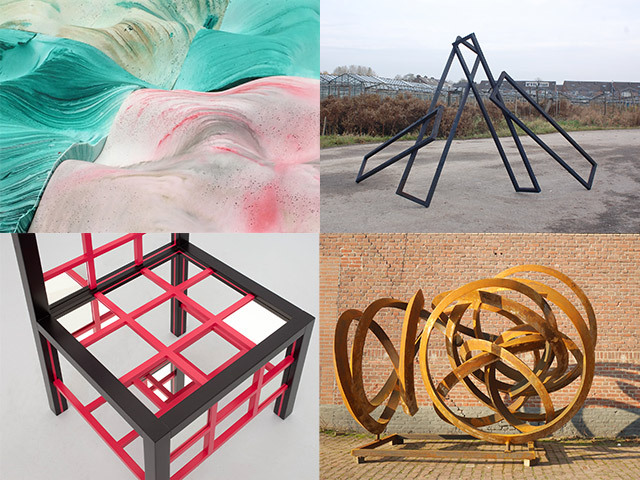 Raakvlakken is a multi-venue sculpture exhibition curated for and sponsored by Beelden in Leiden (BIL). It is part of a nation-wide celebration -Mondrian to Dutch Design- of the 100th anniversary of the founding of the Stijl movement and the publication of the magazine of the same name by Theo van Doesburg who was living in Leiden at that time. For BIL, we have selected 11 young Dutch (or those who have studied in the Netherlands) artists to create a work site-specific for the Hooglandse kerkgracht. As a surplus, we selected 16 international artists to exhibit existing work in a Leiden' landmark office building, the 'Achmea gebouw'. Last, three sculptures were placed in front of the Leiden University Medical Center. Hooglandse Kerkgracht: Dario Bongiovanni, Lorena van Bunningen, Joakim Derlow, Tijl Orlando Frijns, Ruben Jager, Hedri Kool, Daan Liu, Ruben Mols, Suzie van Staaveren, Olle Stjerne and Rein Verhoef. Leiden University Medical Center: Dieter Balzer, Pieter Obels, Ewerdt Hilgemann.